SEO is a practice that encompasses a whole host of different factors. You need to do proper keyword research to ensure your pages are targeting the right terms. You need to make sure your website loads quickly which means compressing images, leveraging caching, and acquiring the best hosting possible. You also need to be sure you avoid any over-optimization pitfalls. But those are the easier elements of SEO. There is one element that many seasoned SEO professionals will admit that even they sometimes struggle with and that is link building: getting other sites to link to yours. If you know anything about search engine algorithms, you are aware of the importance of links in ranking well for valuable keywords. The number and quality of links pointing to your site give search engines an idea of how important and well-regarded your website content is. The more high-quality websites you have linking to your site, the better your site will perform in organic search. One of my best tips for link building would have to be the broken link strategy. A great example of this is Wikipedia or industry blogs/magazines. Firstly, I look for listings or articles that could easily be talking about my client – and I scan the pages for broken links. Many business’ move websites or close down and many publishers will not think to update links on their blogs or articles pointing to them. Once you’ve identified some broken links, it’s time to introduce yourself. A quick ‘Hi there, I love your content, but I noticed this resource you linked to is broken – may I suggest linking to this similar resource instead? It’s a great time to update this content as I’m sure, like me, the topic has become hot again’ etc. This has a two fold effect – a link for you or your client, and newer, updated content for the blogger/magazine if they take your advice. You could even offer to update the content for them if budget/time allows. Using Google Alerts or paid tools like Mention.com, set up alerts around your brand and when mentioned ask if they could include a link so the reader would know where to find you. It’s as simple as that. Thanks so much for covering our recent CUSTOM RESPONSE TO COVERAGE. Anyway, I’m reaching out today with a small request – is it possible for you to include a link to link to our PAGE, http://WEBSITE.com where you mention PLACE YOU WANT LINK on the post? I think it would add additional context for your readers, and of course, would be much appreciated on our end as well. Thanks so much for considering and if nothing else, cons ider this email a thanks! And there you have it, a steady stream of natural and relevant links. Pro Tip: Your brand isn’t just your brand name – think broader to your owners, executives and exclusive products. Set up alerts for ALL THE THINGS! One of our top link building strategies is reverse engineering competitors. To do this, we use SEO software such as Ahrefs to analyse domains linking to our competitors and we will then run this against a database of our existing referring domains. This then leaves us with a list of unique domains who we will then contact in order to obtain a link to our website. Whether this be a standard link, replacing the competitors link or contributing some content, this is a great strategy. The domains already linking to your competitors have already taken interest in your industry and as such, the conversion rate of obtaining these links can be quite high and they are mostly very relevant sites. Researching your competitors is a great way to identify low hanging fruit and valuable new opportunities. By evaluating the backlink profile of your competitor(s), you can use their hard to create a list of new link building opportunities; I suggest using a tool such as Ahrefs for this. Make a list of your competitors and create a spreadsheet with all their backlinks including necessary metrics to determine the value of each link. This approach can easily be used for adjacent markets (companies who share your customers but don’t compete with you directly). Once you have your list it’s time to perform the necessary actions based on the opportunity, this could be a: directory, guest post, sponsorship, membership/association, new partner, or other. Review a relevant product/service online. No matter the business you’re in, you’re likely to be using a service or software that has a strong online presence and also wants to promote client/customer testimonials. This will bring up all the .edu sites that have “SEO” anywhere in the site’s text. This will bring up all the pages with “SEO” and “links” in the title tags. This will bring up all the directories with a page that has “SEO” in the title tag. This will bring up all the “favorite links” pages with “SEO” in the title tag. This will bring up all the .edu pages with “SEO” in the title tag. This will show all the web pages with “SEO” in the title tag, “SEO” in the url and “SEO” somewhere in the body content. This will display all the government sites with “favorite links” pages and “SEO” somewhere within them. This will display all the pages with the phrase “suggest url” somewhere on the page and with “SEO” in the title tag. This will show all the pages with “blog” somewhere in the title tag and the phrases “links” & “SEO” somewhere within the site. Find more search engine operators here. Community involvement is still very much under-utilised in SEO, especially when it comes to taking advantage of local chamber of commerce or business alliances. Not only is a chamber of commerce link reasonably authoritative, it allows for relationship building with local businesses which can in turn lead to more links in the future. If your business is already a member of a chamber or alliance, you may find that your website hasn’t been linked to properly. Quick e-mail outreach in this scenario often leads to more backlinks in less than a day. A surprisingly easy way to gain valuable .edu backlinks is to create something that universities will want to link to, such as a scholarship. This process is as simple as creating a scholarship landing page on your site, complete with application information, and then locating university webpages which link to similar schemes. After you’ve found a few possible fits, conduct outreach activities to let these institutions know about your new scholarship, and ask them to link to your site. For a few hundred dollars a year, you could attract strong .edu links, and help ease a university student’s financial worries. One of my techniques is to perform outreach to bloggers and other webmasters whose sites are semantically close to my niche. I win their trust and become a contributor. After that happens, I contact other webmasters offering them a link from my unique article, which will be featured on a certain website. They only have to link back to the article and they will get a link to their website. By doing this, I’m building exposure for my article and creating a solid backlink profile for it. This way the content I provided will be even more valuable, it’s exposure will be huge, and the overall link juice will be beneficial. Find Amazon products related to your niche, categorize the user questions being asked and publish responses on your site. Link out to them with a shortened answer on the Amazon product page. By far, my favorite technique is reaching out for guest blogging opportunities using “social help” sites like Quora as fuel. I have discovered that, if my writing sample for a guest blogging opportunity is a well-voted and well-read Quora on a related subject, I have much better success in landing the guest spot (and the associated backlink). Charity programmes – we match charity donations dollar for dollar to a number of high profile charities [and receive links from these charity sites]. Use HARO and SourceBottle to acquire backlinks. As an Australian company, SourceBottle is more effective for us as we often get ignored on HARO for not being American. This type of PR is something that few of our competitors are doing so it’s useful for separating us from the pack. In sum, this list of link building tips will put you on the right path toward ranking your website content in search engines. 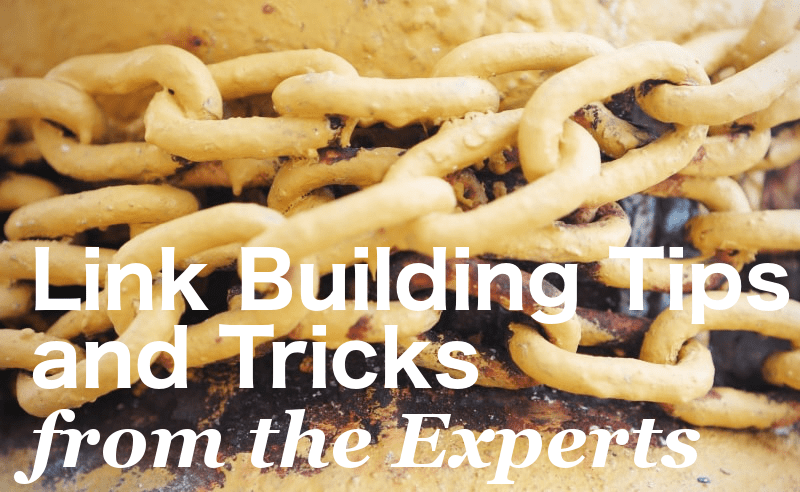 Try a few of these link building tactics and you will be well on your way to building your site’s domain authority and growing your organic (and referral) traffic. For more ideas on link building, check out the Best SEO Books. Cheers! I am a Chicago SEO expert with extensive experience helping numerous businesses grow their organic traffic. If you’d like help with your SEO, contact me today.